Groupthink is a term first used in 1972 by social psychologist Irving L. Janis that refers to a psychological phenomenon in which people strive for consensus within a group. In many cases, people will set aside their own personal beliefs or adopt the opinion of the rest of the group. People who are opposed to the decisions or overriding opinion of the group as a whole frequently remain quiet, preferring to keep the peace rather than disrupt the uniformity of the crowd. Why does groupthink occur? Think about the last time you were part of a group, perhaps during a school project. Imagine that someone proposes an idea that you think is quite poor. However, everyone else in the group agrees with the person who suggested the idea and the group seem set on pursuing that course of action. Do you voice your dissent or do you just go along with the majority opinion? In many cases, people end up engaging in groupthink when they fear that their objections might disrupt the harmony of the group or suspect that their ideas might cause other members to reject them. Janis suggested that groupthink tends to be the most prevalent in conditions where there is a high degree of cohesiveness, situational factors that contribute to deferring to the group (such as external threats, moral problems, difficult decisions), and structural issues (such as impartial leadership and group isolation). Illusions of invulnerability lead members of the group to be overly optimistic and engage in risk-taking. Unquestioned beliefs lead members to ignore possible moral problems and ignore the consequences of individual and group actions. Rationalizing prevents members from reconsidering their beliefs and causes them to ignore warning signs. Stereotyping leads members of the in-group to ignore or even demonize out-group members who may oppose or challenge the group's ideas. Self-censorship causes people who might have doubts to hide their fears or misgivings. "Mindguards" act as self-appointed censors to hide problematic information from the group. Illusions of unanimity lead members to believe that everyone is in agreement and feels the same way. Direct pressure to conform is often placed on members who pose questions, and those who question the group are often seen as disloyal or traitorous. Groupthink can have some benefits. 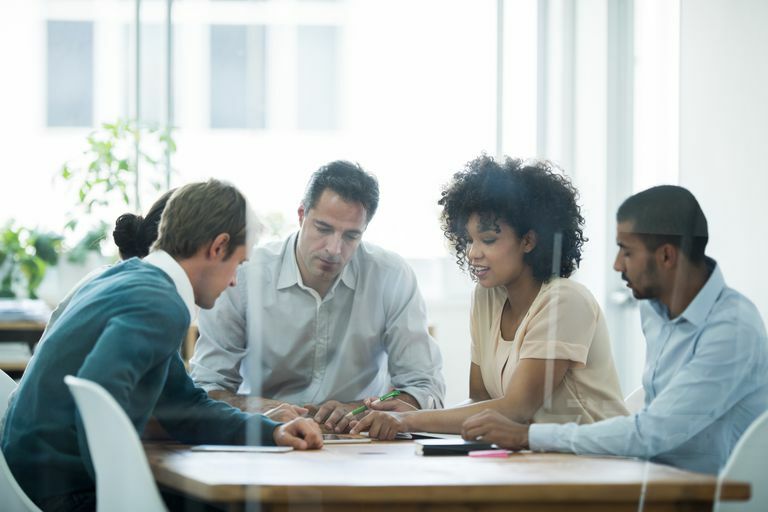 When working with a large number of people, it often allows the group to make decisions, complete tasks, and finish projects quickly and efficiently. However, this phenomenon also has costs as well. The suppression of individual opinions and creative thought can lead to poor decision-making and inefficient problem-solving. A number of factors can influence this psychological phenomenon. It tends to occur more in situations where group members are very similar to one another and it is more likely to take place when a powerful and charismatic leader commands the group. Situations where the group is placed under extreme stress or where moral dilemmas exist also increase the occurrence of groupthink. Initially, the leader of the group should avoid stating their opinions or preferences when assigning tasks. Give people time to come up with their own ideas first. Assign at least one individual to take the role of the "devil's advocate." Discuss the group's ideas with an outside member in order to get impartial opinions. Encourage group members to remain critical. Don't discourage dissent or challenges to the prevailing opinion. Leaders should be absent from many group meeting to avoid overly influencing decisions. "When present, these antecedent conditions are hypothesized to foster the extreme consensus-seeking characteristic of groupthink. This, in turn, is predicted to lead to two categories of undesirable decision-making processes. The first, traditionally labeled symptoms of groupthink, include illusions of invulnerability, collective rationalization, stereotypes of outgroups, self-censorship, mind guards, and belief in the inherent morality of the group. The second, typically identified as symptoms of defective decision-making, involves the incomplete survey of alternatives and objectives, poor information search, failure to appraise the risks of the preferred solution, and selective information processing. Not surprisingly, these combined forces are predicted to result in extremely defective decision-making performance by the group." "The member's firm belief in the inherent morality of their group and their use of undifferentiated negative stereotypes of opponents enable them to minimize decision conflicts between ethical values and expediency, especially when they are inclined to resort to violence. The shared belief that 'we are a wise and good group' inclines them to use group concurrence as a major criterion to judge the morality as well as the efficacy of any policy under discussion. 'Since our group's objectives are good,' the members feel, 'any means we decide to use must be good.' This shared assumption helps the members avoid feelings of shame or guilt about decisions that may violate their personal code of ethical behavior. Negative stereotypes of the enemy enhance their sense of moral righteousness as well as their pride in the lofty mission of the in-group." "The tribe often thinks the visionary has turned his back on them. When, in fact, the visionary has simply turned his face to the future." "For it is dangerous to attach one's self to the crowd in front, and so long as each one of us is more willing to trust another than to judge for himself, we never show any judgment in the matter of living, but always a blind trust and a mistake that has been passed on from hand to hand finally involves us and works our destruction." "The important thing about groupthink is that it works not so much by censoring dissent as by making dissent seem somehow improbable." "Groupthink being a coinage – and, admittedly, a loaded one – a working definition is in order. We are not talking about mere instinctive conformity – it is, after all, a perennial failing of mankind. What we are talking about is a rationalized conformity – an open, articulate philosophy which holds that group values are not only expedient but right and good as well."